‘Kas, you have an amazing grasp of the obvious…’, this is what a friend uttered to me about 30 years ago during my University studies. At first I did not know if it was an insult or a compliment?? Always trying to be an optimist, I chose to take it as a compliment. The SRS Vision tab here contains and is likely linked to ideas of many entities/individuals. None the less it seems beneficial to regularly work on fundamentals of any way of Art, in this case let’s call it the Art of Life in any way. In other words, the thoughts and ideas expressed here by me are possibly one, two or three decades old but hopefully they continue to point in the way of and towards sustainability and permaculture like values. The SRS Vision tab includes ‘The Generalist Blog’ which is also linked to our SRS Facebook page that we finally came around to starting. After all, we are supposed to be builders, not writers… The idea of ‘The Generalist Blog’ is to convey thoughts that come from a place of generalizations, not sweeping ones but sensible ones which as always evidently have exceptions. Staying aware and knowing this, we are able to use the power of generalizing to be in touch with ourselves and whole approach selves?? While pursuing Architectural studies and professional life, it quickly became clear that the job of an Architect is unique and it is understood by thinking people that it is one of a few Generalist type professions. In modern and even traditional societies, specialization has for a long time been needed and a functional aspect of society. If you specialize in something, you can start to do it very well and thus your skills and mastery develop value. However, in the case of the responsibilities of an Architect, if anyone has an imagination, it would not be difficult to see that managing the work of probably over a dozen or so other specialists can be daunting. This is why most Architects use the power of generalizing, estimating and considering feasibility with their imaginations to develop complex building projects in a realistic manner marrying dream and reality in buildings. The Architect not only manages the work of all of these tradespeople and builders but is also responsible for designing functional structures that fulfill the many needs of society including psychological and aesthetic needs. 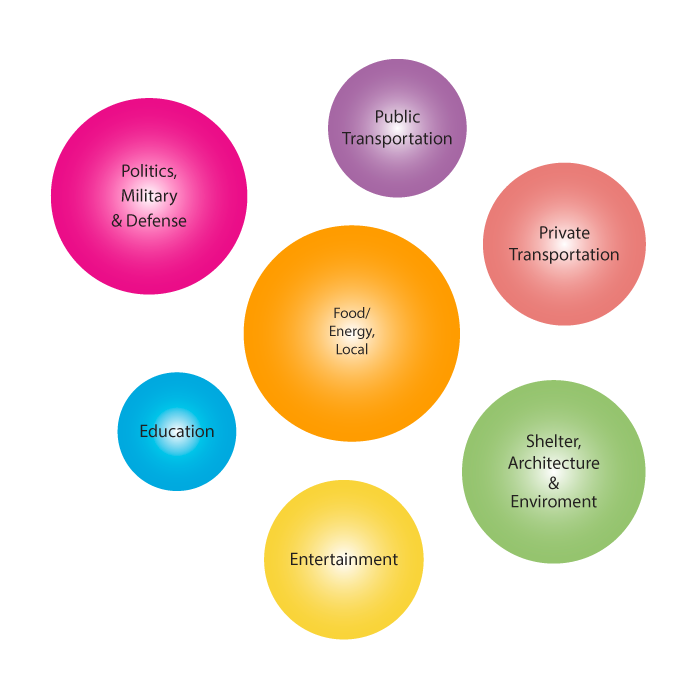 Food/Energy/Local- First and foremost we need food and energy to live; so this bubble is at the central location and it will always be our central need but of course in one way or another it is tied into all of the other categories.. If we don’t have life, we don’t have all of the other complications that go along with it… In any case, it is always central and it is always large but if you notice, in the second diagram, the word local is placed there and the point is: Any way we can, we must strive to get all of our food and energy from local sources and this is usually not so hard to do.